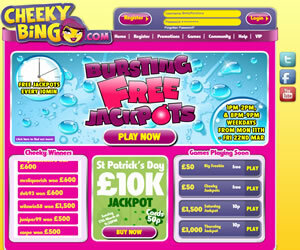 Cheeky Bingo was the first ever online brand to introduce free bingo on a regular basis but whilst others have since come along and run with the idea, Cheeky Bingo has sort of become a non-entity in comparison. The site opened to players on 5th February 2009 and was one of many standalone brands launched by Cashcade. The site is now owned by bwin.party. The brand have advertised their wares on television on a number of occasions, at first ucheeky their mascot as the face of the brand. She was later replaced by the Cheeky Boom Boom commercials and the site sponsored the Jeremy Kyle show in rotation with other brands from the Cashcade camp. Registration to the site takes no time at all and within minutes you are ready to play. Visit the bingo lobby and you are greeted with a whole plethora of information about the rooms that are currently open. You will find ticket prices, game type and number of players in the room as well as other information that all helps you to choose a room that suits your budget and gaming requirements. Free bingo seems to have taken a bit of a back seat in comparison with other brands with a similar ethos although there are eight free rooms available in total. Five of these offer 90 ball games and three with a 75 ball offering. Two of the rooms boast larger jackpots than the others but these are only available to depositing players. The other six are open to both depositing and unfunded patrons of the site. 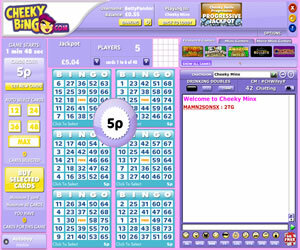 Powered by the 888/Globalcom bingo software Cheeky is popular with many players and the focus appears to be on cheap and cheerful games. The navigation tabs from the lobby included Free Bingo, 5p and 10p tabs where as the Cheeky Mix tabs offers a selection of bargain games. 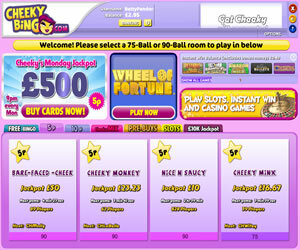 Cheeky Bingo offers three variants of the online game but 90 ball bingo is in the most rooms. Other rooms have 75 ball pattern bingo but there are a couple that offer 75 ball five-line games. This is a brand that many of our readers will already know but whilst there is a nice selection of free and cheap games, the promotions are a little on the poor side. You will find a selection of jackpot games available to pre-buy but there is no substance to the promotional schedule at this site. 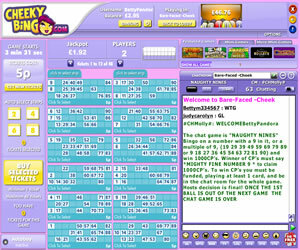 Cheeky Bingo offers 90 ball bingo and two variants of the 75 ball game, the traditional pattern bingo and five-line bingo. The wagering requirements set out in the Terms and Conditions state 2x the amount of deposit and bonus received. However a withdrawal may be processed prior to meeting these requirements so long as you have deposited a minimum of £5 in your lifetime as a player and made at least one wager on bingo or instant win games with the brand but bonus funds will be forfeited at the time of withdrawal.